With the nominations of former astronaut and retired Marine Corps Major General Charles Bolden and former NASA associate administrator Lori Garver as the next number one and two to lead NASA President Barack Obama has taken the first step in building a space legacy for his administration. To date, the President has given comments that provide both hope for the future of manned space exploration and cause for concern. It was President Obama who early in his campaign remarked “Why should we send people into space when we have kids in the U.S. that can’t read”. Later in the campaign while in Florida he remarked “I’m a space guy”, but as recent as the interview that Administrator Designate Charles Bolden had with the President it was widely reported that he was told there would need to be cuts in the manned space program. 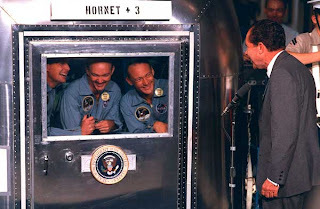 The space age Presidents it seems have had a love-hate-indifferent relationship with NASA to the extent that we’ve had the extremes of one that wanted to cancel the program (Nixon) and one that helped get us to the Moon (Kennedy). For a program that has the capacity for such positive public relations for America and a symbol not only of our technical prowess, but for our children to aspire to learn engineering and highly technical skills it seems to be one that Presidential leadership (with the exception of a very few) has failed to embrace and leverage. Even Barack Obama’s statement of “Why should we send people into space when we have kids in the U.S. that can’t read” sounds like an excuse that gets trotted out to contrast educating kids against expensive machines to go back and forth to space. Why then did Barack Obama indicate that he wanted to double U.S. foreign aid? Did we solve poverty here in the U.S.? Seventy-three million dollars just went to Zimbabwe and another two-hundred million dolars went for refugees in Afghanistan. All of this while tent cities and skid row sections of major cities are growing during this recession. If a sending person into space is less important then the literacy of kids then it would only figure that keeping money here in America to solve problems of homelessness and hunger is more important than foreign aid. We spend four billion dollars on manned space exploration. We’re doubling, yes, doubling foreign aid to fifty billion dollars. My point is that in the priority of what we spend NASA is low on the totem pole. To single it out is often not out of need, but out of a sentiment towards manned space exploration in general. In this case a potentially negative one. While it is too early to tell where the new President will land on the list of most influential Presidents in the history of the space program we can take a look at the previous ten administrations of the space age and rank their position on the list. It should be no surprise to anyone who sits at the top of the list as the President who did the most for the space program and which President(s) did the least or in this case the worst job of managing the program or setting a vision for manned space exploration. What’s most troubling about this list is that the Presidents at the bottom outnumber the Presidents at the top and aside from positions #1 and #2 on the list the remaining can all be questioned as to their true commitment and advancement of the program. The top four names on each list are for the most part indisputable, but there are great distances between each, and at first glance one could see a pattern that the worst Presidents for the space program is dominated by Republicans by a margin of 2-1. This isn’t a total surprise. Since Kennedy’s overwhelming support of the space program it has always been associated with the Democrats. Since the incumbent President is a Democrat conventional thinking would lead us to believe that he also would be good for the program, but time will tell. Let’s take a selective look hitting the highs and the lows since NASA was founded in 1958. On the high end of the list as the “best” Presidents for the space program. 1. John F. Kennedy – It was fitting that when JFK was sworn into office his set of goals for his Administration was deemed “The New Frontier”. It was Kennedy’s inspiring challenge right after Alan Shepard’s flight that put America in the new frontier of space and on a course to land on the moon. 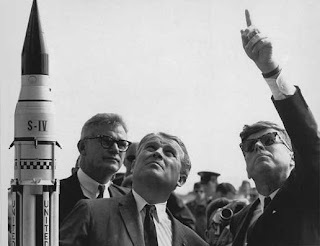 Kennedy grew the space program with both resources, funding and political support. His Vice President Lyndon Johnson was assigned oversight and to ensure the administration’s political support with the congressional leaders. Johnson was the perfect man for the job as he had the clout with Congress from his tenure as a powerful Senator to make sure it there would be no roadblocks. In Kennedy’s day both the program and the goal of landing on the moon became an “all hands on deck” approach. Kennedy had put aside the mistrust that Eisenhower displayed for using the German engineers and made reaching the moon everyone’s goal. 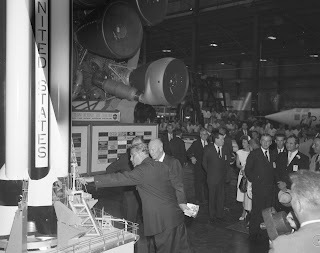 Kennedy was also visible to the program appearing at launches and briefings. His interest was more than passing or lip service he believed in America’s ability to reach the moon. It was the dawn of the high-tech space age and Kennedy wanted America to be the leader. Kennedy tops the list for giving more than casual support to the space program and ranks alone as the only President to effectively wield his political clout to support space initiatives. While still in its infancy he challenged NASA it to achieve bold, but at the time unthinkable goals, and NASA delivered. 2. 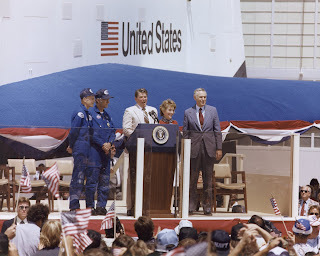 Ronald Reagan – A surprise to many at number two, but no President since Kennedy threw his support behind the space program like Reagan did and no President after Reagan has done so. Reagan was a strong supporter of the space program and was the President in office when the first Space Shuttle flight occurred in April of 1981. He was also in office during the first in-flight loss of life when the Challenger exploded in January, 1986. Reagan who had been wounded during an assassination attempt two weeks before the first launch of a Space Shuttle was unable to attend Columbia’s maiden voyage in person, but during his term he believed and fought for a strong space program and after just four flights he declared the Space Shuttle “operational”. While in hindsight the assessment may have been premature it reflected his enthusiasm and belief in the Shuttle as a platform for space exploration. It was Reagan who over the objections of many of his advisors went ahead with the plans for Space Station Freedom which would later become the International Space Station and while “Freedom” never got off the ground during the Reagan administration and underwent numerous revisions and battles with Congress it was Reagan’s initial vision that gave it life and allowed it to survive initial doubts and become the current showpiece of joint space efforts between nations. Reagan did not articulate a broader vision largely because the existing vision had literally just gotten off the ground. Reagan came into office just as the United States was getting back into manned flight after a long hiatus and did not challenge the existence or strategy of the Shuttle, but rather supported it. After the Challenger accident Ronald Reagan's eloquent words comforted a grieving nation "There will be more shuttle flights and more shuttle crews and, yes, more volunteers, more civilians, more teachers in space. Nothing ends here; our hopes and our journeys continue." In no uncertain terms after the worst disaster of the U.S. Space Program he assured all Americans manned space flight would continue. The Space Shuttle program post-Challenger stood down for a significant time while the program was retooled to fix the problems that uncovered during the Challenger accident, but never was the cancellation of manned space flight a consideration. Many believed the Shuttle would lead to a resurgence of the American space program. It would take time to understand that new technology and its place in the annals of space exploration and whether it would be the right platform to achieve greater objectives in space. Long after Reagan left office and long after his death the Shuttle still flies. 3. Lyndon B. Johnson – Upon Kennedy’s assassination LBJ picked up the responsibility for seeing that Kennedy’s goals were achieved. Johnson added a few of his own and quickly became mired with a multitude of tasks and programs that bogged down his administration at a time of increasing strife and unrest in America. Johnson’s “Great Society” and the escalation of the Vietnam War never seriously threatened America’s commitment to manned space. In a way it was Kennedy’s clear challenge and his subsequent death that kept the program on track. In Kennedy’s brief time as President the goal of landing a man on the moon was perhaps his most publicized public and certainly highly visible goal and Johnson would not be the man to end that dream. As a tribute to the fallen Kennedy, Johnson would ensure that goal was achieved, but LBJ failed to lay the groundwork of what would follow. The demise of the post-Apollo era began with LBJ and as the goal of reaching the moon became more evident the program had already started winding down. Nixon deserves harsh criticism for setting the space program back by forcing major cuts and leaving it without a vision and a goal, but Johnson made the decision easier for Nixon by beginning this process even before Nixon took office. Still, Johnson despite growing unrest in the country over civil rights and the Vietnam War resisted stopping the program. It would turn out that America’s achievements in space gave momentary pause to the national strife and managed to even unite the world as a symbol of what humans could achieve. 4. Dwight D. Eisenhower – Perhaps a little controversy with ranking Eisenhower so high after all it was on Eisenhower’s watch that the U.S. was upstaged by Sputnik, and it was Eisenhower who prolonged the development of missiles as a mainstay in the U.S. arsenal by concentrating on bombers as a weapons delivery platform and that subsequently delayed advances in rocket technology. Perhaps most damaging was his disdain for the German rocket team and alienating that group and their work from potentially advancing American space technology. His direct exposure to the horrors of World War II made him reluctant to place America’s technology future in the hands of Germans. Eisenhower did leave one enduring legacy of the space program, the creation of NASA. NASA got off to a rocky start as a new government agency. Ike did not have a clear goal in mind for the program, but achieved a significant objective – he made the program a non-defense agency and united what were many disparate and costly programs into a more efficient cooperative vision. It was this groundwork and unified agency that would make putting people into space a core focus and that in turn gave Kennedy the head start on achieving his goal by putting the team to execute that vision in place. Eisenhower could have very easily militarized the space program and made a single branch of the military responsible, but he didn’t and that legacy of NASA lives on fifty-years later. My list of the least effective “Space Presidents” will certainly cause some rebuttal, but here is the brief reasoning behind the Presidents that have done the most harm or have done the least for the space program. There are two that stick out on this list (Nixon and Carter). There isn’t much that can be said about Bush (41), Clinton and Bush (43) for their commitment to the space program was lukewarm at best. Each can cite an accomplishment or two, but the reality is that they did little to move the program forward. As for Gerald Ford, he spent so little time in office that its almost unfair to give him the ranking as the third worst President for NASA, but he did very little to advance the manned space program forward. Granted, he was cleaning up the mess from the previous administration, but there was no vision from a man who earlier in his career was a staunch supporter of the space program. 1. Richard Nixon – Nixon has no equal when it comes to being the worst President for the space program. He could own the list all by himself and perhaps he should. Despite having the good fortune of being in office when the first landing by a human (an American) on another world occurred Nixon didn't seize the momentum or chart his on next steps for the American space program. Nixon was too preoccupied with the Vietnam War, later Watergate, and burdened by his own insecurities to focus on the space program. For him, landing on the Moon accomplished the dream of his political enemy JFK. Nixon originally wanted the manned space program ended after Kennedy’s goal was achieved. He prematurely ended the flights to the moon even though the hardware for three additional landings had been bought and paid for. Eventually, Nixon’s aides convinced him to keep the manned space program alive. As a compromise Nixon wanted the NASA budget cut drastically and a cheaper solution found. He positioned it as a new era of space travel, but in reality he really couldn't have cared less. The Space Shuttle was born of that initiative, an incredible machine, but a single method of what should have been a multi-part program. Americans built the amazing shuttle and could have continued enhancing the Saturn program to provide Americans with a versatile launch capability, but we didn't due to Richard Nixon's disdain for the space program. The same Richard Nixon who had a speech drafted to read should the Apollo 11 mission fail and the astronauts remain trapped on the Moon. For Nixon failure seemed an option after all. The Skylab program accomplished much with very little, but Nixon didn't have the forethought to fund America's space program and keep it on a track that would have dominated for decades. He couldn't see the legacy that would have left behind for him much like Kennedy's space legacy lives on today. Had he seized the moment we would be talking about how Richard Nixon was responsible for Americans on Mars. Instead, Nixon is the man who single handily took the world's preeminent space power and technology leader and set us on a course that would cause the program to drift for decades. Today, as a result of Nixon's failed vision for space exploration we are in another space race. This time the race between countries is just as footnote. The real race is one of survival, one of keeping NASA in the business of achieving goals and putting humans in space. Why don't we have Americans on the Moon or Mars? The blame rest solely on the shoulders of Richard Nixon. No President has done more damage to the America space program than this man. Just barely did the future of manned space flight survive Richard Nixon. Nixon’s failure as an advocate for space exploration while it was at its prime is just another failure we can add to his presidency. 2. Carter - Since Alan Shepard first went into space during the Kennedy administration every President has had a manned launch on his watch except Jimmy Carter. While the blame for that is not Carter’s alone it is a dubious distinction that reflects overall on his attitude towards manned space flight. Carter exhibited an interest in unmanned exploration, but did not advance the cause of human exploration. During Carter’s time construction of the Space Shuttle fleet had begun and it was Carter against NASA’s recommendation that cut the Shuttle fleet from five to four. Carter’s administration was mired in the malaise that had come across America in the waning years of the seventies – high unemployment and interest rates, energy crisis and hostage crisis were all issues that distracted his administration. The typical caricature of Carter as a “peanut farmer” misrepresented that he might have been one of our more intelligent and educated Presidents. As a Naval Academy graduate that worked on submarines and who was accepted in the Navy’s nuclear propulsion program Carter seemed an ideal candidate to advance the cause of manned space exploration. Carter’s Presidency came and went in four short years and he did little to support NASA or advance the cause of manned space exploration. 3. Bush, Clinton, Bush - All had their opportunities to paint the next generation of manned space exploration and all either let the status quo ride or lacked the political clout or will to change directions. George Bush (41) tried to paint a vision to go to Mars, but faced with a hostile opposing party majority in Congress his plans went nowhere. Former President Bush (41) is an example of a President who wanted to move the dial for manned space exploration, but didn’t possess the right combination of skills and support. That Vice President Dan Quayle was his point man on the initiative spelled doom from the start. Whereas Vice President, Lyndon Johnson wielded a mighty stick with the Congress for Kennedy and could push programs through Dan Quayle was a relative unknown and not so well respected Junior Senator. His clout was absent and the program was DOA with the Congress. Bill Clinton resisted the advice he was given to cancel the Space Station Freedom project and instead opted for a joint initiative with the Russians on what would become the International Space Station. This opportunity was made more convenient by continued problems onboard the aging Russian Mir station and a cash strapped Russian government that needed financial aid for its space program. Those conditions presented a window of opportunity for a joint project. Had Mir been in better shape or had the Russians been financially better off and opted for their own station the International Space Station likely would have never been built which may have altered U.S. space strategy. No one will ever know, but Clinton deserves a nod for keeping the ISS alive even if the reasoning was purely for political purposes to engage the Russians in a positive outreach. George Bush (43) did little for the space program up until the Columbia accident. Bush’s core focus early on was to reign in costs at NASA especially with the ISS. Bush (43), much like Clinton was content to let the space program ride status quo. There wasn’t a consideration of the next generation post-Shuttle vision until the Columbia accident and even then the new “Vision for Space Exploration” (VSE) was just a very broad framework with the details left to NASA and future administrations to deal with. For Bush, the VSE wasn’t a bold new strategy like his father tried to portray, but rather a strategy born out of tragedy and necessity. Unlike his father, the second Shuttle accident convinced the Congress that it was time for a new strategy and the concept of a change in direction came with no real objections. There was little resistance to Bush's broad space vision in large part because the details were yet to come and because everyone knew a change had to take place. What we are seeing now with the Augustine Commission and questions about Constellation and whether the Moon or Mars should be a target are the result of both Clinton and Bush failing to lay the groundwork for a smooth transition from Shuttle to next-generation spacecraft. Had the Columbia accident not occurred it likely there still wouldn’t be a new vision or Shuttle replacement strategy in place today. In the hearts of American the U.S. Space Program has been a source of pride and accomplishment. Forty years after we landed on the moon we realize how incredible a feat it was. We see that it will take longer to get back there even though our technology has made quantum leaps from mid-to-late sixties technology. The reason is not technology; the reason is because we’ve lacked the right strategy and a President who can garner both public and congressional support. Not since Kennedy have we had the right Presidential message and the right Congress to get the manned space program what it needs. In a recent poll 52% of American supported in increase in funding for the space program, but that public support has been at odds with either the President or the Congress. It seems unlikely based on what we’ve seen so far that Barack Obama will crack the top five of most influential Presidents in the space age. During his first term it is likely we will see the shuttle retire and we will be without a manned launch capability at least until his second term (if reelected). Early indications are that Obama is more likely to hold the status quo then to go to bat for a bold trip back to the Moon or Mars. Once again the climate for raising the space program back to new heights just isn’t right. Our only hope may be that the next President is the one we’ve been waiting for to be the advocate we need for manned space exploration.